A Victorian poet once remarked that the true purpose of literary criticism is "to make the best that has been thought and known in the world current everywhere" so that we may all "live in an atmosphere of sweetness and light." By that standard, how does Christy Clark: Behind the Smile – the new "unauthorized" biography about BC Premier Christy Clark written by a former member of her own party – stack up with Western civilization's other great works of literature? Not good. Terrible, actually. At least if you believe what those snooty book critics have to say about it. 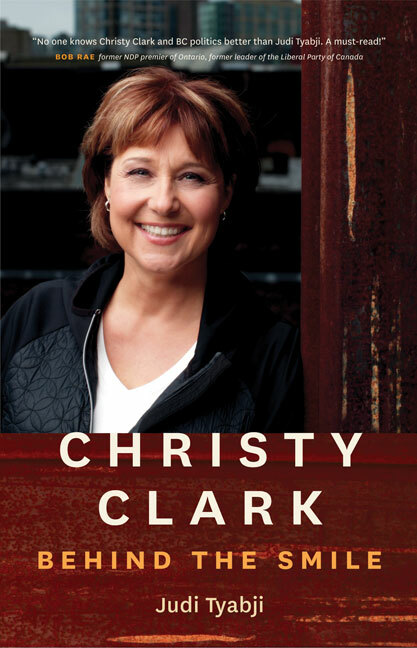 That might come as a surprise, seeing as the book's cover even features a quote from former federal Liberal leader Bob Rae promising Christy Clark: Behind the Smile is a "must-read." But maybe you're wondering: what would the cover of Christy Clark: Behind the Smile look like with real quotes from real book reviews? The Vancouver Sun says Christy Clark: Behind the Smile is "a friendly biography of the premier" that is "clearly written" with "pages and pages of photos," but also adds that the book "is not at all critical" of the premier. Meanwhile, Maclean's magazine explores the book's intriguing back story involving the relationship between Judi Tyabji, the author of Christy Clark: Behind the Smile, and the book's subject: Christy Clark. Macleans' review of Christy Clark: Behind the Smile points out Clark and Tyabji "first met when the two were Young Liberals in the early 1980s," a friendship that was strengthened after the author and her husband, former BC Liberal leader Gordon Wilson, received a $128,000 grant from Clark's government, with $67,000 apparently going directly to her biographer. "The biography was unauthorized," the review says, but adds that "it’s not clear the premier will appreciate the help." That thread is also picked up by a review in The Georgia Straight, which details the unusual circumstances where the subject of a biography helped the biography's author "get through some tough times." And over at The Tyee, another book review confronts the issue of authorial intent. Suggesting Christy Clark: Behind the Smile includes instances where the author "cleanses" history, "relies on lengthy quotes from Clark herselfand supportive comments from her inner-circle" (some of whom currently face criminal charges) and "gives Clark plenty of space to expand on her oft-repeated soundbites," the review says the "error-laced book reads like [a] promo in an election year." Well, who cares what those highbrow critics think, right? Photo: JON_CF. Used under Creative Commons license. Heritage House Books.